I'm a member of another Flickr group called Swap 'Til You Drop. It's another swap for miniature (6-12") quilts with monthly themes. For the group's first month (September), the theme for the month is hearts. The piece I am making is in progress and in good shape, but I'm not ready to share pictures yet. I did, however, already receive my quilt from my partner, and it is wonderful! It's difficult to convey the quality of the craftsmanship through pictures, but I can honestly say that my first impression of this quilt was not so much the colors or the design (though I love both), but how well this little quilt was made. It feels solid and sturdy, with absolutely no flaws to speak of ... truly professional-level quality, in my humble little opinion. Thanks so much, Denise! I am so lucky to receive this quilt and this little piece will be cherished in our home. you are a bit of a swap-a-holic, but i can sure see why when you receive quilts like this. there must be a 12 step program for that somewhere! I find it hard to say no to many things LOL! Wonderful quilt!!! Very manly! Great quilt, you do seem to be entered into many swaps. It is fun and addicting. I am only in one swap and having trouble finding time to make that quilt. Not sure how you do it. Wow, she really did make a successful manly heart quilt. Very nice. Oh, that did come out nicely! I had a hard time keeping up with one swap, and had feelings of inferiority, so I would be no help! I need to get off the swap wagon too. Just for a little while so I can finish some UFO's. Right after I wind up the 3 that I'm in! I still owe you a sleeve tutorial, I haven't forgotten! You get the neatest swap packages! I love this one, it's completely charming! Very nice! You receive the neatest mini quilts! I for one am glad you didn't "just say no" to our group (swap til you drop) because we would miss you. Can't wait to see your finished quilties. I just found your blog. What a great manly heart quilt. I've looked through your blog and your work and color sense is terrific! Great new layout! I still have yet to kick start my blog -_- I can't say no to swaps either so I can't help ya :P But everything you've received and made is beautiful! It IS wonderful! And the blanket stitching on the label is one great idea also. That is a great little quilt. I love the hearts and the label is so neat. I always have trouble with the labeling part but that's an excellent idea. Take care. That is a really fabulous, yet manly heart quilt I love the quilting. She did an amazing job. I am so impressed! Why say no?! Here's another one that looks cool!!!! http://www.embelish.blogspot.com/ a Christmas Ornament Swap! Do it! I'm just as much of a swap-o-holic as you seem to be! You are one amazing swapper- John! 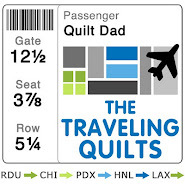 Hope your knees are feeling better and healing up, Quilt dad! 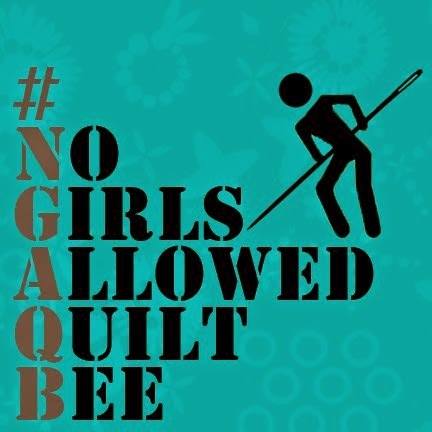 Wow, a guy that quilts, I just had to read your blog. It is lovely, your kids are gorgeous too. Happy stitching, Julie. oh my what a wonderful little quilt!! i just love it!! Ok, I know you WANT to say NO to swaps. . . but did you see that Doll Quilt Swap 5 has opened??? LOL, I'm a glutton for punishment too. . .and I'm already on the list!